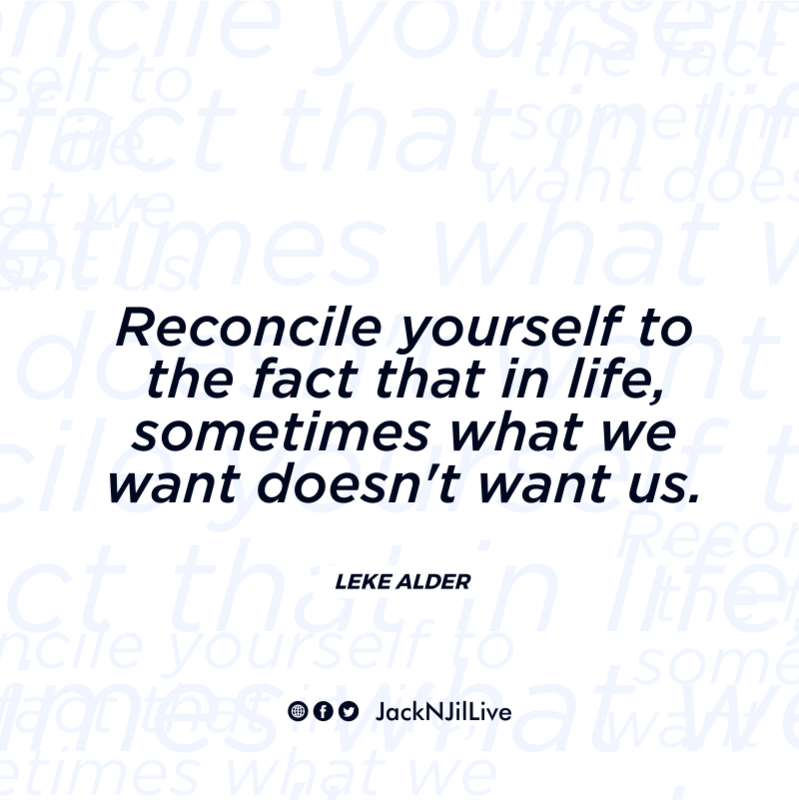 “Reconcile yourself to the fact that in life, sometimes what we want doesn’t want us”, Leke Alder. This was a tweet I saw this morning, and it’s so profound. It reminded me of an article I wrote titled “Don’t Awaken Love Until it Pleases”. Every day I read in the news, how someone would kill another person they use to date, simply because they are no longer together. These days we make it compulsory that someone who we fancy or love must love us back. That feeling is wrong; the feeling that someone you love must love/marry you. Love is a choice; it is a decision that should not be made on compulsion. DO NOT FORCE, MANIPULATE OR CAJOLE someone to love you, it speaks of a terrible low self esteem; having a healthy self esteem means that you love yourself too much to be with someone who’s not thrilled to have you in their life. What would you rather have, a one sided relationship/marriage with someone you think you cannot live without, simply because you’re so much in love with the person or waiting till you meet the one, who’s thrilled and count he/herself lucky just to have you in their live? Reconcile yourself and be at peace with yourself, that sometimes what you want may not want you. It’s not an easy feat, but it is achievable; with maturity, confidence and self love. This Is It S01E06 "Clash Of The Muendas"